Art imitates life. Life is the expression of divinity through a liminal mirror of time and timelessness. Reflect. This is the 11th installment of the weekly series Oliver’s AfterThoughts. Each Friday morning at 11:11 a.m. ET US I post a card from the Afterthoughts tarot deck by Corrine Kenner. These single card pulls are designed to express the energy of the Oliver collective, a flow which vibrates at the frequency of unconditional love. If you feel guided to experience your reality at such a state of consciousness these readings are indications of what you may expect for the week ahead. The Kenner Afterthoughts deck is based upon the concept of “what happens next?” in the scope of a classic tarot reading. In tarot, the cards in the spread show what is occurring. If you continue to pull cards, or clarifiers as they are known, you’ll unveil the history leading up to the shown events. But, then what? What can you, the conscious, 1HP creator expect moving forward? What is about to unfold? And, thus, you have… After Tarot! In traditional tarot, the Three of Pentacles is associated with teamwork, initial fulfillment, collaboration, and learning. Showing a young apprentice with two architects who are holding “plans” for the cathedral within which they are shown standing, the apprentice appears to be discussing his progress. Even though he is less experienced, the architects listen carefully as they value his opinion and his specialist knowledge. There is also an acknowledgement that this young man is an essential contributor to the completion of the cathedral and the architects want to make sure that everyone is on the same page. As viewed in Kenner’s “after tarot,” the work is complete, or nigh so. The Three of Pentacles is expressed as the card of artistic mastery, whether it is passed down from teacher to student or learned through experience. A sculptor steps back to assess his work — a marble statue of a young boy with a basket on his back. 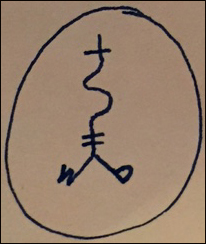 He’s standing near an arched doorway with three starry pentacles at the top, and his work is tucked into an alcove. His tools, including a hammer and chisel, are lying on his workbench. He’s got his cloak over one arm, as if he’s either arriving or heading home at the end of the day. The setting, a church, is the house of God. It’s a reminder that our physical bodies are also temples, and we are spiritual beings in physical form. Arches are symbols of strength and support. In a church, arches are entry points into liminal space; they serve as thresholds between this world and the next. They’re solidly grounded, but they draw our attention up toward heavenly ideals. 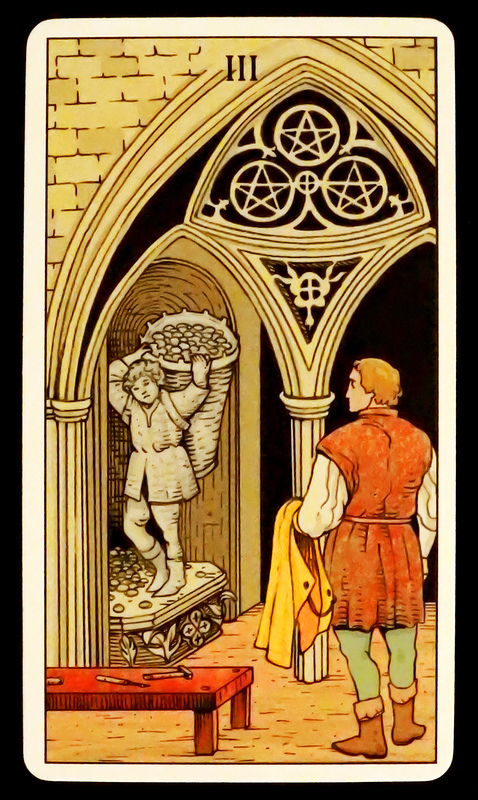 The three pentacles under the arch symbolize triple gods and goddesses, as well as the union of body, mind, and spirit. An alcove is a recessed, vaulted area that can symbolize the safety and protection of the womb. The sculpture doesn’t depict an angel or a saint, as you might expect, but a child laborer. He could even be a slave. Art is a tangible reminder of God’s grace and presence. In fact, great art often seems to flow through a creator, not from him. Tools, like the hammer and chisel, can be used to create or destroy. Historically, if the Three of Pentacles came up in a man’s reading, it would portend celebrity for his eldest son. Astrologically, it’s associated with Mars, the warrior planet of energy and assertion, in Capricorn, the earthly sign of business, career, and social status. You are the apprentice. You are the architect. You embody the gift of dualism in singularity. That which you learn, that which you incarnate is yours to share. Be strong in your faith – in the knowing you are a creator, and what you manifest is beautiful, lasting, and of eternal value..